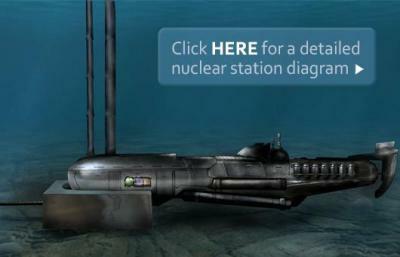 Offshore, underwater nuclear power plants would visually resemble nuclear-powered submarines converted to house multiple nuclear reactors, as many as six to achieve 1 GW of power production. Offshore, underwater nuclear power plants would visually resemble nuclear-powered submarines converted to house multiple nuclear reactors, as many as six to achieve 1 GW of power production. Propulsion, missiles, and other systems related to defense or not necessary for this new power-generation mission would be removed or reduced in scale to make room for the additional reactors, generators and condensers, and optional hydrolyzation and desalination modules. The plant would use U.S. naval nuclear technology, taking advantage of the Navy's 5,700 reactor-years of safe operation in the marine environment. 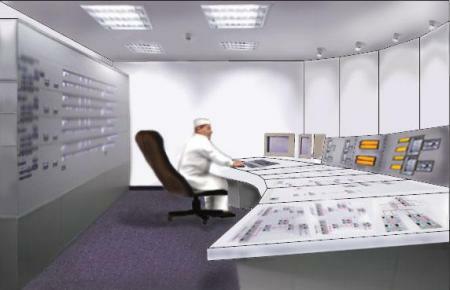 Underwater operation provides certain inherent safety benefits, since overheating due to loss of coolant is one of, if not the largest, risk factor in a nuclear power plant. The safety and security advantages of being remote from population centers, as in previous offshore platform or floating nuclear plant proposals, apply, but underwater siting also eliminates risks from weather and accidental collision, and reduces the risk of terrorist attacks like the one against the U.S.S. Cole. 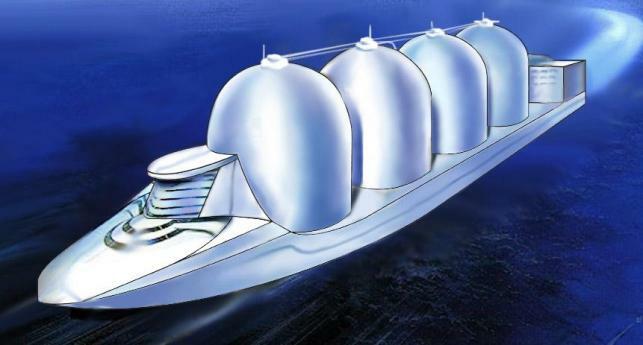 Underwater power cables would transmit energy to shore, and excess capacity would be used to hydrolyze water into hydrogen for shipment by either pipeline or overseas in gigantic hydrogen tanker-dirigibles, with the fresh water condensed from the process as ballast in what would also be the world's largest desalination operation. The electrolyzation process would also produce oxygen, which could be shipped and stored along with hydrogen for use in high-efficiency power generation to supplement renewable energy sources such as wind and solar during low production conditions. These would be government-owned/contractor-operated facilities, with companies bidding competitively for the rights to build and later operate the plants, and paying hefty fees for security (provided by the Navy, Marines and Coast Guard). Established U.S. Navy protocols for supervision, safety and security of nuclear reactors and materials would be strictly enforced. New classes of support and security submarines would also be developed, or adapted from existing mission-flexible designs, for those roles. In terms of scale, it would take about 15,000 one-gigawatt plants to supply the 15 terawatts the species currently uses. Adding some capacity for growth, with a plant every mile, and about five deep along the Pacific, Atlantic and Gulf U.S. coasts, there would be room for 20,000 plants. To start with, just one plant every mile along the U.S. coasts would roughly supply all domestic energy needs. Regenerative, so-called breeder technology would be fully implemented, to reduce waste and allow the use of the 99%+ of earth's naturally occurring Uranium that is normally not fissile. (The Nuclear Energy Agency says that advanced reactors and the reprocessing and recycling of uranium "could increase the long-term availability of nuclear energy from a century to thousands of years.") The scale of this project is huge - eliminating greenhouse gas emissions and virtually all air pollution. Energy abundance to use for, among other things, cleaning up the environment. Hugely improved productivity, prosperity and resources for social programs, improving the standard of living and fighting poverty around the world. In short, public and private wealth, and a planet to utilize and enjoy them in. Click here to see what brought us to such a concept. 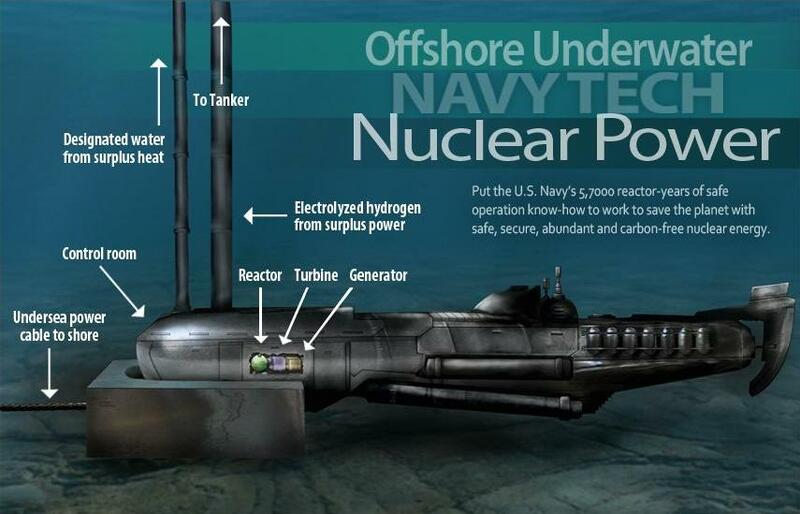 Click to read more about the navy tech submarine nuclear power, its potential, and how it's possible.